It’s so crazy isn't it? We prep weeks in advance for the Holidays, and it comes and goes before you know it. Hours of cooking is eventually shut down by 15 minutes of consumption followed by a food coma. Hours of holiday shopping and wrapping presents comes to a close in a matter of minutes, once the first piece of wrapping paper is ripped off. With New Year’s Eve upon us, we at Accessory Genie are happy to offer one last great Holiday Deal before 2015 busts through the door. Just when you thought the Holidays were over, we are offering FREE SHIPPING on all orders placed on January 1st through Midnight PST when you use coupon code 'NEWYEAR15' at checkout . Take advantage of this deal any time tomorrow. While waiting for your New Years Eve party to begin, take a moment to enjoy some fun facts about the New Year. Julius Caesar is the first person responsible for making January a national Holiday. It’s named after Janus who is the Roman god of doors and gates. Famous for having two faces, one of these faces looks forward and the other looks back. The New Year’s Eve Ball Drop in Times Square first started in 1907. According to lore, eating leafy greens, cabbage, ham and black eyed peas brings prosperity for the New Year. More vehicles are stolen on New Year’s Day than any other holiday. Some of the top New Year's Resolutions include losing weight, eating more healthily and saving money. 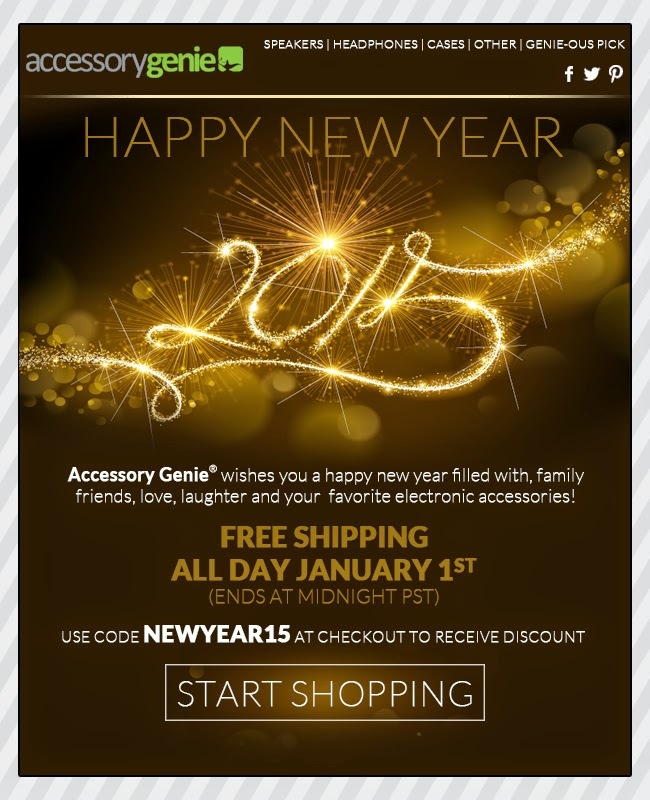 Everyone here at Accessory Genie wants to wish you a very happy and safe New Years!